Has the fabric on your favorite piece of furniture worn thin? Perhaps you’ve had your décor updated and want your furniture to match. Or maybe you have a precious antique or keepsake in need of restoration. If so, schedule a consultation with St. Matthews Trim & Upholstery by calling (502) 785-8561. We offer expert advice with an array of fabric samples, contemporary to traditional, to choose from. We're especially proud of the fact that after 63 years of dedicated service. 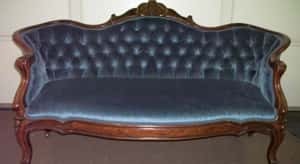 By providing our customers with unparalleled craftsmanship and quality, St. Matthews Trim & Upholstery has earned a reputation for artistry and excellence in upholstery reconditioning and repair. Our success is firmly rooted in the fact that we take extreme pride in our service, our workmanship, and our styling. 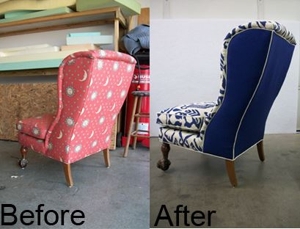 One might say we re-imagine your furniture through re-upholstery. We can customize your furniture with leather, vinyl, or fabric, creating custom looks for your chairs, recliners, sofas, cushions. stools, love seats, booths, or any piece, including recovering of office furniture. We've even repaired church pews! We can repair minor damage to your existing leather furniture, as well. "Extensive research produced a lovely velvet reminiscent of the fabric this client remembered when the sofa belonged to his grandparents. Exact patterns were made to replicate the construction and design of the original piece. When completed, the client was thrilled the settee matched his memories and yet was now a functional addition to his own home." Reinvigorate and Renew Your Prized Possessions at St. Matthews Trim & Upholstery.